This is a digital product. After purchase, we’ll follow up with the digital versions. The unconditionally-guaranteed Creating Perfect Health System is a home-study program of more than 15 hours of audio and video-taped live lectures and seminars, and some written material. This program will teach you everything you need to know to maximize health, vitality, mental clarity, energy level, and to help you easily and effortlessly achieve and maintain your optimal weight. 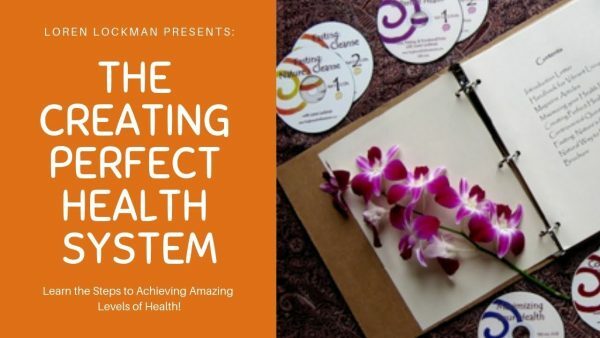 The unconditionally-guaranteed “Creating Perfect Health System” is a home-study program of more than 15 hours of audio and video-taped live lectures and seminar. Additionally there is supporting written material as well. This program will teach you everything you need to know to maximize health, vitality, mental clarity and energy level. You will learn how to easily and effortlessly achieve and maintain your optimal weight. Because these things are inextricably linked, it’s virtually impossible to affect any one of them without affecting the others. 1) simple to understand and easy to implement. In order to ensure that you learn and can then apply this information, we utilize both repetition and the power of different methods of learning. Research shows that repetition is a powerful tool and that most of us need it to really learn anything. It also shows that no matter what your dominant, and therefore, preferred, way of learning is (i.e. seeing, hearing, etc. ), a combination of different approaches insures the greatest comprehension and retention. Or, to put it more simply, the more different approaches used, the more we learn and remember. Maximizing your Health Lecture – 132 minutes on video. This lecture was taped live in front of an audience of a 100 people in London, England. It covers diet and fasting and is an excellent introduction to the subject matter. Fast-paced, fun and informative; this is a great place to start. Fasting: Nature’s Cleanse – 90-minute download. This informative and fun lecture was taped live in Portland, Oregon. Controversial Questions: Looking to Nature for the Answers – 90-minute download. Another great talk taped live in Portland, Oregon. The Essentials: Eight Keys to Optimal Health – 28 page booklet which summarizes all eight of the keys and makes a great companion piece to the audio and video materials. As some of the names of the presentations suggest, all of this material is based upon over 20 years of studying and synthesizing what nature has to teach about our health. The contribution Loren makes is in presenting the material in such a way that it’s fun and easy to understand. Best of all, if you implement it, you are guaranteed to create and maintain the highest levels of health possible. His expertise has helped many people feel years younger, and experience a level of vitality they have never known before.